Research ads reduce the remaining research time of a selected action by 1 hour. Up to two ads can be watched before an 8 hour cooldown becomes active. To view the option to watch the ad, press and hold on an active research action. 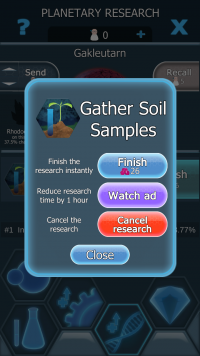 One of possible Red Bacteria rewards is a reducing the remaining time for all research activities. The free reward provides a 5% reduction, which can be raised to 25% by watching a short video ad. There's a random chance that a Tier 3 or Tier 4 daily quest will give some reduction to active research time (5% reduction for completing a Tier 3 quest and 15% for completing Tier 4). The reduction is applied at the moment you collect the reward. Dark Matter Institute offers various technologies that provide reduced research time or - in the case of Alter Intellect - speed up all active research types whenever you mutate two Evolved Bacteria. This page was last edited on 23 October 2018, at 12:49.